Cars that sat in our driveway and our neighbors' long ago. These relics wandered the suburbs, creeping up and down streets with families inside. 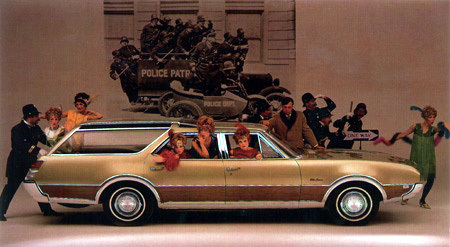 Rare and collectable to some, the station wagon was the SUV of the '60s and '70s. They didn't tower above, like today's minivans. You could actually see around them on the highway, when everyone rode at the same height. 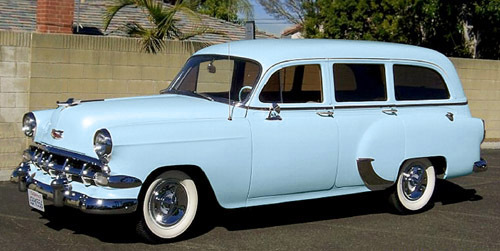 Very few wagons were produced in '54. Our cousin's had one in Horizon Blue. It had a forward facing third seat, and was nicknamed the "Bitty Blue Bus". 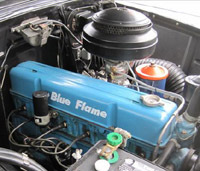 In 1954, Chevrolet's biggest engine for passenger cars was the Blue-Flame 125, an inline 6-cylinder. It was 10 hp more than the Blue-Flame 115 base engine, because of a new "High-Lift" cam. The 125 was only available with Powerglide models, which was a 2-speed automatic transmission. 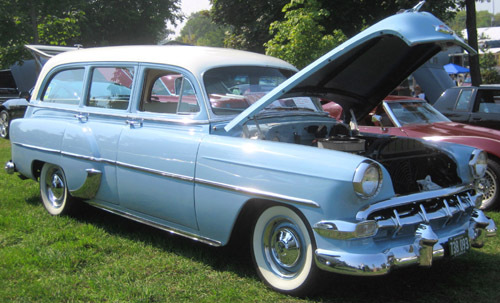 All GM divisions offered V8 engines for their 1954 models, except Chevrolet until 1955. 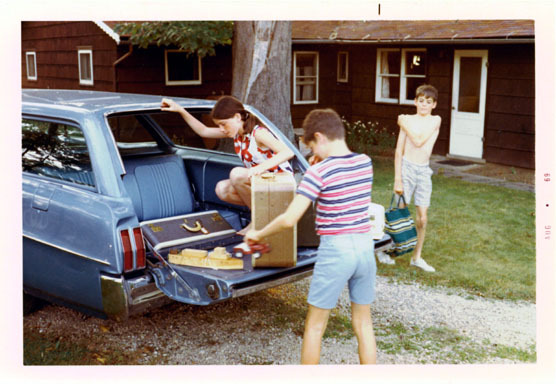 Our first family wagon was slightly used car, a hand-me-down from Dad's boss. It was loaded with accessories, AC, leather seats, power windows, seats, and "Safety Sentinel," which informs the driver that they have exceeded a pre-set speed. This 1960 models also featured the "Safety Spectrum Speedometer" with a colored dial that starts out green, changes to orange at 35 mph, then turns red after 65 mph. It was a "thermometer speedometer" as Dad put it. An urban myth claimed the speed dial changed color a fourth time, from red to silver at 100 mph. But us kids just yelled, "Go red Dad, go red!!!" The shift quadrant sequence for the Jetaway Hydra-Matic "Slim Jim" transmission was P-N-D-S-L-R, with reverse all the way down! Auto safety experts criticized GM for the Hydra-Matic's a-typical design. 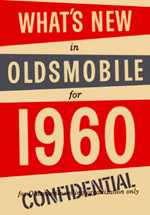 Oldsmobile's selling point was to make it easier for drivers to rock their cars loose when stuck by having adjacent forward and reverse gears. 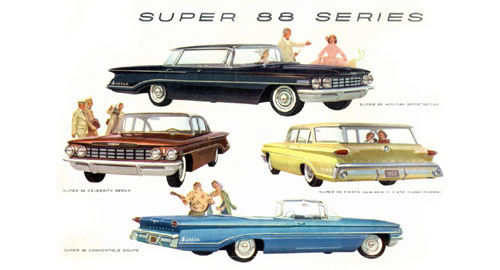 GM changed the standard to the more common P-R-N-D-S-L sequence by 1965.
green for both 280 hp base and 260 hp versions. Only high-compression 330 hp version was red. Reverse was still at bottom of shift quadrant. Much like the photo that came in a new wallet, these are not my parents. 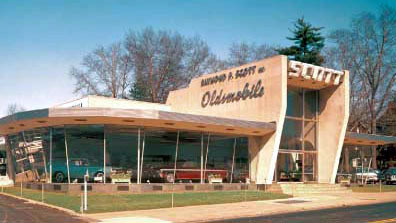 They were supplied by Oldsmobile marketing as an optional family. Mrs. Olds demonstrates Navy semaphore signaling she'll use to safely land husband in driveway after late nights at the office--supposedly. Trading places. You can tell it's a three-seater by the unmistakable bulge behind the right rear wheel. Fiesta's spare tire stow space was relocated from center rear of car to right rear fender area to accommodate the third seat. Surprisingly, these tanks rolled only 14 inch wheels, rather than 15 inch that became the norm. It was our very first factory new wagon like model pictured above, except it had red interior and small standard hub caps. It didn't have AC, power windows, or power seats. If memory serves me correctly it burned premium, which suggests it was most likely the 280 hp version. 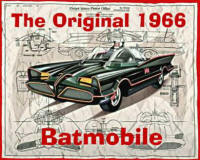 It also had the same wacky P-N-D-S-L-R shift quadrant sequence as the '60 Olds. For 1963, buyers could choose from one of three 394-cu.in. 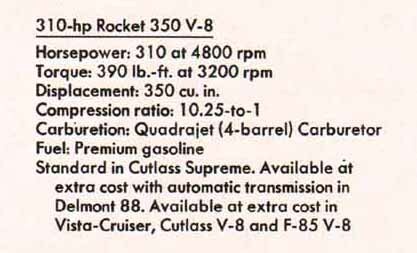 V-8 Rocket engines, each with the same bore and stroke and hydraulic lifters. 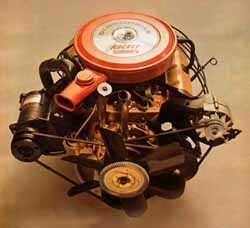 The base version had a two-barrel carburetor and 10.25:1 compression ratio, produced 280hp and 430-lbs.ft. of torque. A no-cost economy version made just 260hp and 410-lbs.ft. of torque, with its reduced 8.75:1 compression. The performance 394 started with the base version and added a four-barrel carburetor, which bumped output to 330hp and 440-lbs.ft. of torque. 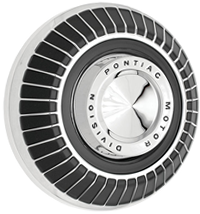 Amazingly, a column-shifted three-speed manual transmission was standard; however, most owners opted for the Roto Hydra-Matic 375 (Model 10) dubbed "Slim-Jim". It was intended to be a more efficient automatic--there was no torque converter, rather an internal fluid coupler, it instead became problematic for owners. The Roto Hydra-Matic did not have a conventional fluid coupling or torque converter but had an internal fluid coupling with a torque multiplier. There was no real bell-housing; instead, there was a kind of flange connecting the transmission to the engine. The power flow from the engine crankshaft to the transmission input shaft was connected via a flywheel containing a set of springs to absorb torsional vibrations at the flex plate. The shifting sequence was very different and much rougher than the Hydra-Matics that preceded it, or the Super Turbines and Turbo Hydramatics that followed it. 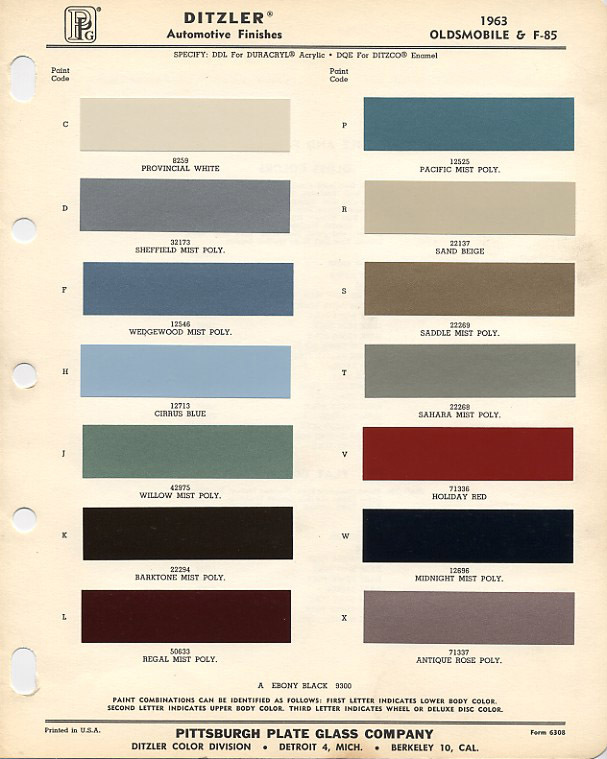 #22269 - Saddle Mist Poly. #12696 - Midnight Mist Poly. 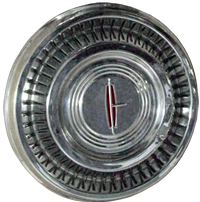 Our family Fiesta was same Provincial White color with small dog dish hubcaps. On long trips kids do get rambunctious. A button on the dash controlled the tailgate window and afforded dads the ability to control childrens' nap time. Just lower the window and let the exhaust backdraft put your kids to sleep. There were three '63 Fiestas within two blocks. Our white wagon, Baer's deep blue, and Brynelson's "golden bomb". As I recall, Baer's Eighty-Eight had AC, and Brynelson's burned Regular, which suggests it was the low compression 260 hp Economy version. 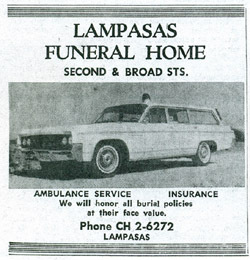 Lampasas Funeral Home, Lampasas, TX. It had the optional engine, the most powerful 350 V-8 available from Olds in '69. OEM engine color was gold. 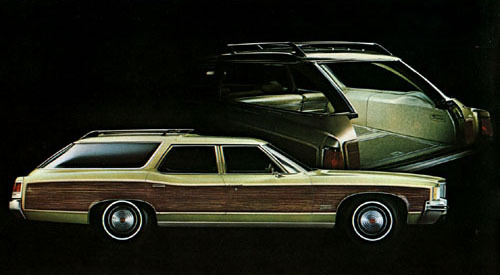 My friend's mother drove one of these gold and wood paneled Vista Cruisers, and we lived in Madison, WI. It had surprising power and flew! It was a sleeper and very fast for a 2-ton mid-sized family wagon. Curb weight was 600 lbs. more than it's brother, the 2-door Cutlass coupe. 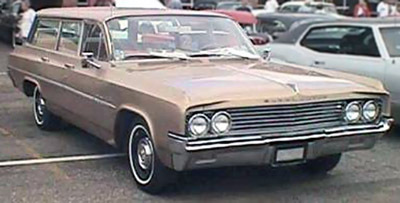 The Vista was identical to the station wagon that commonly appeared on the TV period sitcom That '70s Show, which aired on Fox television network from 1998 until 2006. Ironically, the show was also about the lives of a group of teenage friends living in the fictional suburban town of Point Place, Wisconsin, from May 17, 1976, to December 31, 1979. The resemblance was so uncanny it made me think if one of the show's writers was from Madison and knew us. If it were actually fact, then I'd say either Topher Grace or Ashton Kutcher was cast to play my part. high compression 400 V-8 2-bbl. Rear view showing open tailgate and backward facing third seat. 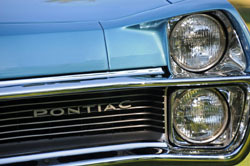 The 1967 Catalina and other full-sized Pontiacs was a redesign year and received a heavy face-lifting of the 1965/66 body shell, with more rounded wasp-waisted body contours and fuller fastback rooflines. It also had concealed windshield wipers, an industry first, although they are not shown as hidden in first brochure image above. The new 400 and 428 cubic-inch V8s replaced the 389 and 421 V8s of previous years. 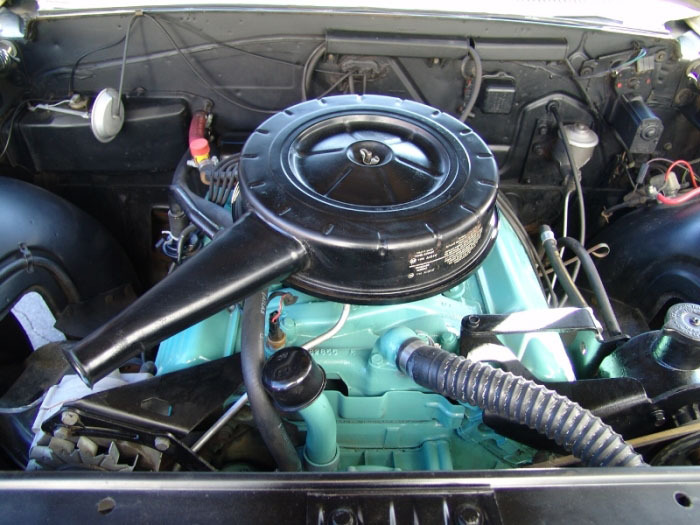 The standard Catalina engine was a two-barrel unit rated at 265 hp with three-speed manual transmission or 290 hp with Turbo Hydra-Matic. 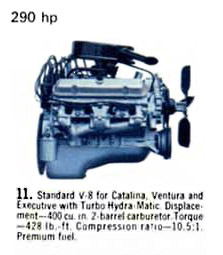 The 265 hp engine was available as a no-cost optional economy engine with the Turbo Hydra-Matic. The lower compression alternative used Regular gas instead of Premium. were on our '67, with rims matching body color. Our three-seat Catalina shortly after arriving at Grandpa's home in Green Lake. Paula, Stan and I were charged with unloading of suite cases and whatnots. My brother and I rode the entire trip together in the third seat with luggage under our feet, facing backward. Photo of child labor camp taken by Dad in '69. This was our first Pontiac wagon, time to switch brands or GM divisions. It was brand-new and had that new car smell of freshly molded plastic. Dad picked it up at the dealer just a day or two before our summer vacation trip to the lake. Every year we drove up to Grandpa's in Green Lake, Wisconsin. He had a modest lake home and cabin on Dartford Bay. He bought it in the '40s and built a small cabin near the shoreline. In the '50s, he also hand-built a two-bedroom house with a three-season porch. Our maiden voyage in the new Pontiac began on a Friday. It was already getting hot when we shoved-off around noon. Even though this new wagon had air conditioning, our parents didn't turn it on until half-way through a nearly two-hour trip. Dad thought we could tough-it-out with the windows down and the air off. I believe his rationale was that our previous wagon didn't have air, so why should we need it now. Like, it should only be used when you really need it for relief, just not for comfort. I think he was worried we'd become AC dependent. That idea didn't make much sense to seven kids packed together like sardines in a frying pan, sticking to hot vinyl seats. We waited with much anticipation to experience Dad's magical world of automobile air conditioning. We had been taunted long enough. (Turn it on already!) It wasn't too uncommon to feel tormented by his morbid curiosity, this time, to see if we could make the whole trip without turning on the AC. He finally gave into his kids demands to turn on the air. Then he had us roll up the windows, which we needed permission to do. It was at this point in time, when we felt cool air on our faces, that we became permanently spoiled by air conditioning, and dependent as Dad feared. I remember feeling privileged and with cool air of entitlement, and wasn't about to dial back the auto accessory clock. After turning onto our grandfather's gravel driveway, we drove up to the house and parked to unload the wagon. I remember getting out of the car with a little trepidation, realizing that it was summer and hot outside. I had to give up my air conditioning dependence, and get busy unloading the wagon. Some serious tonnage at 4,818 lbs. is nearly 500 lbs. more than our previous 1967 "Ponti-hog" 3-seater. 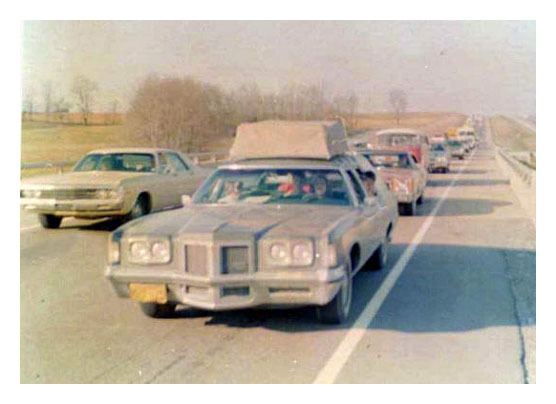 Our trip to Florida in March 1972 in the new wagon. Under-exposed photo taken by Dad, during holiday traffic jam on Georgia's I-75. Paula is at the wheel, with Stew, Stan, Stacy and Mag riding along in bewilderment. Shadow casts show it was late afternoon. Our Florida-bound drive was mostly smooth sailing; but to everyone's surprise, we hit a traffic jam in the middle of nowhere, southbound through Georgia on I-75. It was actually a fairly new stretch of interstate, which became a parking lot in the blink of an eye. It was stop and roll traffic for an hour or two. That's when Dad got the idea to stretch his legs to work off some tension by taking a short jog down the shoulder of the highway. He was an engineer with hidden artistic talent, having a mindset that fostered quick simple solutions to challenges. He was never afraid to try a new route or shortcuts on other trips. But, to work off angst and abandon your children on a highway halfway across the country seemed ridiculous. One of my siblings said explicitly, "Dad - you are NOT!" He downplayed his crazy idea of abandoning the SS Pontiac’s helm (and us) just to get in 5-10 minutes of exercise. For him, it was a no brainer and a feeling none of his kids shared. Yet, we realized there would be entertainment value in witnessing his stunt. So, Dad gave the wheel over to Paula, who just got her driver’s license and told her, "If cars start moving just keep driving alongside me… I’ll keep up with you, and hop back in before traffic takes off. This situation reminded me of a neighborhood family, whose kids I was pals with. Often while driving home on some errand they’d let their small black poodle out a block early, then take off. We laughed and cheered little Chi Chi on, who had a top end of about 30 mph. He loved to run alongside the car too. Like a Chinese fire drill, Dad said to Paula, “Ready… go!” Out the door he went, and in jumped Paula. It was like a driver change at the 24 Hours of Le Mans. Our jaws were hanging, and were a bit embarrassed when we noticed other drivers around us doing the same. We still wondered if we’d become orphans, that somebody would call police or contact child services. That’s when I visualized someone in white chasing Dad with a net as they ran down the shoulder together. Then cars began to creep forward more and more. Paula began to panic, realizing none of this was on her recent drivers exam. We were beginning to catch up with dad, just like he said. Traffic was beginning to move faster, and Dad was sizing up the moment when he and Paula could make another driver switch. It was like a movie, where some bum is running along the tracks trying hop in a moving train. Luckily traffic stopped dead again and Paula put the car in park and got out. Then one of the other stranded drivers asked Dad, So… see anything up there?" A few minutes earlier that driver was flustered that Dad’s jog was going to make things worse, and now the guy wanted a traffic report from him! It became a moment of levity. That’s when Dad grabbed his 35 mm camera from the car and took a photo of us kids in the car on the jam packed Interstate.